Producing food on a large scale without killing any animals seems currently impossible. This poses a challenge for deontological positions that involve a prohibition against killing sentient creatures: it seems that according to these positions omnivorous, vegetarian and vegan diets all rely on food produced in impermissible ways. In order to meet this challenge, deontologists might introduce consequentialist considerations into their theories, for example some principles that effectively require to kill as few animals as possible. This is the kind of strategy Tom Regan has pursued. However, we argue that the challenge for deontological positions on the ethics of food production can also be met by invoking a prominent deontological principle. The doctrine of double effect (DDE), with its distinction between bringing about harm intentionally and bringing about harm as a merely foreseen consequence of one’s action, enables us to see a morally significant difference between the various ways to produce food other than the number of animals killed. 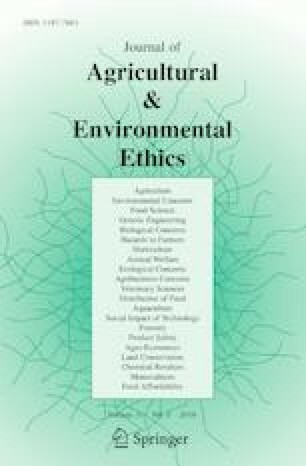 In this paper we will review some of these ways using Warren S. Quinn’s version of the DDE and show that a more thoroughgoing deontological ethics of food production than Regan’s classic theory is possible. We thereby present a novel way of evaluating modes of food production.